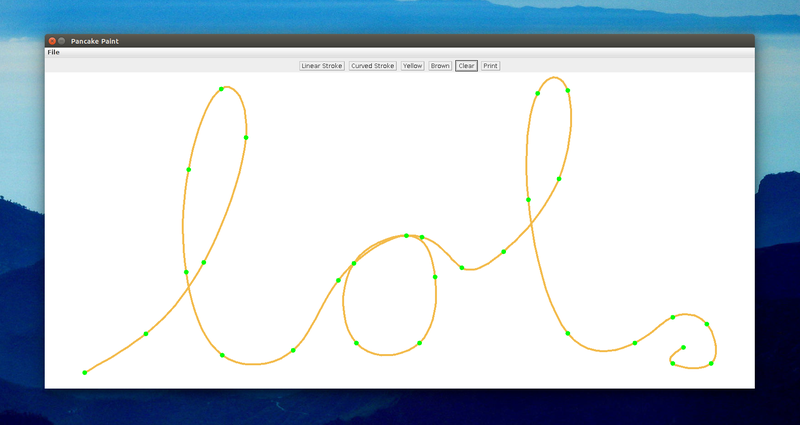 The pancake drawing user interface is a desktop application where you can design the pancake of your dreams. Drawings can be made with linear and curved strokes to form anything you can imagine. This application is written in Java and uses the swing library for graphics. We chose to use this toolset for a few reasons. First and foremost, Java is both platform independent and efficient. These traits make it easy for anyone to run the interface on their own computer. Additionally, there is great support for the libraries we need. The windows themselves were constructed using Java’s built-in swing package, which everyone who has the Java Runtime Environment can use. There is also great support for serial communication to Arduino from Java. In fact, the Arduino IDE, uses the same library that we have chosen to work with in order to upload programs and communicate serially.